Dave Roman is the author of several graphic novels including Astronaut Academy: Zero Gravity, Teen Boat! and Agnes Quill: An Anthology of Mystery. He has contributed stories to Explorer: The Mystery Boxes, Nursery Rhyme Comics, and is the co-author of two New York Times bestselling graphic novels, X-Men: Misfits and The Last Airbender: Zuko’s Story. Roman is a graduate of the School of Visual Arts and worked as a comics editor for the groundbreaking Nickelodeon Magazine from 1998 to 2009. He lives in Astoria, NY. 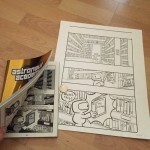 Check out his latest comic Starbunny, Inc.
Astronaut Academy was drawn with a #2 pencil on Strathmore Bristol paper. It’s then inked using Speedball Super Black india ink applied with a Windsor Newton Series 7 brush and eventually graytoned in PhotoShop. 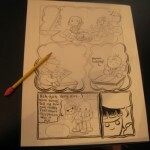 The books are a combination of hand-lettered and using a font based on my hand-lettering. Hakata Soy. Recently enrolled at Astronaut Academy, Hakata is the silent, brooding type with a mysterious past. He was once the leader of a heroic group of friends called the Meta Team, which saved the galaxy from the Gotcha Birds and other villains. Hakata hoped to keep his head down and avoid making friends so as not to put anyone else in danger. But he ended up sitting next to Miyumi San in class, who immediately insisted they be allies. Miyumi San. A strong believer in the optimism of youth, Miyumi’s biggest goal in life is to not end up a stereotype. She tries to get along with everyone, but is extremely competitive when it comes to her longtime rival, Maribelle Mellonbelly. Miyumi is the first student at Astronaut Academy to befriend Hakata Soy, which makes her a target for other girls who have their eyes on him (like Maribelle). Miyumi grew up on Earth, and is part of a twee-punk band called The Supercutes. Maribelle Mellonbelly. The self-proclaimed richest and most pretty girl at Astronaut Academy, Maribelle prides herself in not being as self-centered as she seems, and not relying on money except to prove a point. She’s not really sure why she and Miyumi are enemies, but assumes it has something to do with when they were in preschool together. She has a fondness for boys who are mysterious (like Hakata Soy). Scab Wellington. Maribelle’s best (and only) friend. Scab is extremely loyal and protective of her friendship with Maribelle, and will attack anyone who threatens it. She has major anger-management issues to work out, and has been known to pull on peoples’ hair and poke them with plastic forks. Tak Offsky. The MVP of the school Fireball team (the Chibi Sesame Seeds), and bunkmate of Hakata Soy. Tak thinks he and Hakata have nothing in common because he doesn’t want to take the time to learn anything about him. He’s also scared that Hakata might steal his potential girlfriend, Thalia Thistle! Tak likes to play the tough-guy role, and pretends to be a bully just to keep people from noticing how much he misses his parents (and their bakery). Thalia Thistle. She would be the Fireball team’s MVP, except she hates anagrams…and wants to keep her Fireball skills a secret from her paranoid father. Thalia is rough and tough on the Fireball field, but extremely sweet and sensitive when it comes to “sissy stuff” like kittens and sappy movies. She may not admit it to her friend Tak, but she does find his new roommate, Hakata Soy, very intriguing. And the more her teammate Tak Offsky tries to tarnish Hakata’s image—the more Thalia likes him! Rodney Blueblatt. Leader of the Chibi Sesame Seeds, the school’s Fireball team that has finally started winning some games. Rodney used to consider himself a laid back kind of guy, but now feels the pressure of living up to the high expectations of his classmates. Rodney seems to be the only one on his team who doesn’t let relationships get in the way of practice. Maliik Mehendale. A team member for the school Fireball team, Maliik is generally one of the most popular kids at school. After sitting behind Sabrina Spitaro in math class all year, he became strangely obsessed with the back of her head. But after having his life saved by Miyumi San, he has completely fallen head over heels in love and refuses to even change out of the clothes he was wearing when they first met. Doug Hiro. An eccentric loner, Doug Hiro daydreams about being shot out of the airlock and floating endlessly in outer space. Doug is often teased for refusing to take off his space helmet in class. He is probably the only kid in school who doesn’t have strong opinions about his fellow classmates because he’s too busy living in his own universe. He has a crush on Mrs. Cupcake, who works in the Guidance Chancellor’s office. Cybert. A robot originally built by Hakata’s best friend Gadget Thompson, Cybert was given life using one of Hakata’s discarded hearts. Upon completion, Cybert was kidnapped by the sinister Gotcha Birds, who reprogrammed him to attack Hakata Soy. Cybert was extremely powerful but kept getting distracted by things like trading card games that kids play during recess. After a trip to the school Guidance Chancellor, he was no longer sure what he wanted to do with his life yet still fell into bad habits because of his programmed nature, which lead to his being blown to bits by one of Miyumi’s sonic fireballs. Luckily his scattered pieces were collected by Team Feety Pajamas, and Cybert has been given a second chance at life. Team Feety Pajamas. Two kids named Monique and Martin who have adopted a teddy bear named Tomcat as their mascot, and chosen the moniker Team Feety Pajamas in their quest to be recognized as super-villains. They create rumors about themselves to build up their image in the hope of convincing classmates that they are really evil. But most people just roll their eyes at the Feety Pajamas’ adorable antics. Billy Lee. With his huge pompadour and disco-style clothes, Billy thinks he is the “hot stuff.” A huge fan of love, Billy is ready to give away his hearts to any girl willing to pay attention to him. Billy is especially captivated by the rivalry between Miyumi and Maribelle, and is jealous of Hakata for stealing his thunder. Calico Hopps. One of the handful of students who descended from Hoppiton, a planet inhabited by bunnies that was once saved by the heroics of Hakata Soy and the Meta Team. She hopes to someday express her gratitude, even though bunnies aren’t known for making a lot of noise. Spike Johansson. His motto is “I like what I like.” And that includes synth pop music, puffy stickers, vintage fashions and cute boys. Spike is also one of the biggest fans of Fireball and never misses a game. Marcos Stamatis. An anti-social loner who tries to live a life of solitude so he can enjoy the silence. He is annoyed by the school’s pre-occupation with Fireball and other physical activities. He once made the mistake of falling in love with a popular girl and giving her one of his hearts, only to find she had tossed in the trash! He believes he can relate to some of Hakata Soy’s struggles, but would rather not get involved with other people. ??? This girl is supposedly very popular, but no one can remember her name! The Principal. A mysterious soldier who wields a mighty sword for education. The Principal has the power to show up whenever someone mentions his name. Mr. Namagucci. Many consider it odd to have an elf for a science teacher, since elves are mostly known to be magic. But Mr. Namagucci takes the laws of science very seriously, and hopes to prove that there are more to elves then what you read in fairytales. Mrs. Bunn. The school’s only rabbit schoolteacher is also one of Astronaut Academy’s oldest faculty members. She likes to consider herself a no-nonsense disciplinarian, but she’s usually the first one out the door during recess. She loves playing hopscotch and betting on which students will get the highest grades. Senõr Panda. The universe’s only Spanish teacher who happens to be a Panda. Pandas have been going extinct forever, but a few still remain of this once-noble race. Many of the students suspect that he really isn’t a very good Spanish teacher, but few know that he’s really an undercover I.B.W. agent hunting out a potential threat to the school involving stolen hearts. Guidance Chancellor B. Wearing a mask to conceal his identity, this school counselor is also the author of the self-help book “Bee’in Yourself.” He believes that kids can be anything they want to be. But little do they know that Chancellor B is, in fact, made of bees! It’s a secret that may have something to do with his obsession with the school spelling bee. Mrs. Cupcake. The school Office Assistant is always upbeat and ready to help out, especially when it comes to dishing out advice on video games! P.S. Gamma Q. Located on the other side of the galaxy, this school of tanuki (Japanese raccoon dogs) has always been Astronaut Academy’s biggest competition when it comes to Fireball tournaments and spelling bees. The Gotcha Birds. The Gotcha Birds have existed for generations, and are generally known to be troublemakers and pests. They claim to be inspired by an urban legend about powerful birds that could fight rabbits, and who ruled the stars. The current Gotcha Birds gang is led by a high school dropout named Rick Raven, who likes to pick on little kids and bunnies. His grandmother makes the bird costumes for him and helps make the snacks. She doesn’t realize that he uses them for “mean stuff,” because she thinks it’s all a big game and is just glad Rick has some friends to play with.